Rarely has Europe seen a king with ecclesiastical loyalties so outspoken yet so susceptible to change as those of England’s temperamental Henry VIII. Other episodes from Henry’s early years, however, hint that his allegiance to Rome was anything but absolute. Henry was a Renaissance king—he learned to speak Latin, French, and Spanish; and he was an accomplished musician and dabbled in theology and in Renaissance humanism, which was often critical of Catholicism. Henry had also welcomed the appearance in England of a New Testament in Greek and Latin, compiled by his friend, the famous humanist Erasmus—despite the protests of many Catholic clergymen, who believed the distribution of the Scriptures was a great threat to their religious control. If Henry’s esteem for humanism weakened his bond to Catholicism, his passion for women severed it. Partly because he needed a male heir, and partly because he was infatuated with Anne Boleyn, Henry divorced his first wife, Catherine, during the late 1520s—and opened a split with the Catholic church that only widened in the 1530s. Henry’s whimsical ecclesiastical loyalties showed in the conflicting church-related directives he issued during the 1530s. He permitted the circulation of English-language Bibles and dissolved the country’s Catholic monasteries. But in 1539, he issued the Six Articles, which reaffirmed his Catholic views on priestly celibacy, the Mass, and the hearing of confession. Henry never embraced Protestantism as much as he embraced himself as head of the church. Thus he persecuted both Catholics and radical Protestants during his reign—anyone who refused to accept his authority in the church. Still, he did more to open England’s doors to Protestantism than any figure of his time. Transforming the nation’s Catholic clergy into leaders of a reformed Church of England was no easy task, and it was largely the work of Thomas Cromwell. Cromwell spent (some say ill-spent) his early years adventuring with the French army in Italy. When he returned to England, he took up his father’s cloth trade and practiced law on the side. 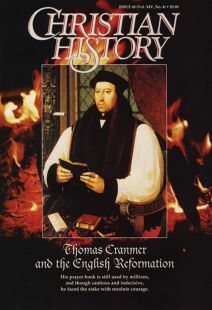 He helped Lord Chancellor Thomas Wolsey dismantle some monasteries to fund Oxford University, and after Wolsey’s fall from power (1529), Cromwell entered the king’s service. At Henry’s insistence, Cromwell pressured provincial bishops at Canterbury in January 1531 to recognize Henry as “sole protector of the church and clergy of England, and, so far as is allowed by the law of Christ, also our supreme head”—effectively undercutting their ultimate allegiance to Rome and beginning Henry’s break with the pope. Because of Cromwell’s effectiveness, in 1535 Henry appointed him vicar general, which entailed supervising church affairs. During the next half decade, Cromwell took several steps to strengthen Henry’s control of English churches. He dissolved hundreds of the country’s monasteries between the years 1536 and 1539, and in the process he swelled the crown’s coffers. Cromwell’s efforts to sever English ties to Rome weren’t always successful. Less than two years after the death of Jane Seymour, Henry’s third wife, Cromwell directed the king’s attention to Anne of Cleves, a German princess of Protestant parentage. This marriage, Cromwell argued, would bless the monarch with several diplomatic advantages. The marriage, however, was disastrous. Anne’s physical unattractiveness, ignorance of English, and dull character repulsed Henry. He blamed Cromwell for the fiasco; charges of treason were brought against Cromwell shortly after the king’s marriage. Cromwell’s refusal to support Henry’s subsequent divorce proceedings against Anne of Cleves sealed his fate. The fallen reformer was executed at Tower Hill on July 28, 1540, supposedly for betraying the crown. When Henry VIII died in January 1547, his son and heir, Edward, was only 9 years old and, naturally, unprepared for royal responsibilities. Henry, however, had prepared the way for a regent: Edward Seymour, Edward’s uncle, became Lord Protector of the Realm. Seymour, or Somerset (by which name he is usually referred since he became Duke of Somerset in 1547), was a Protestant with Calvinist sympathies. He directed reforms that far surpassed the changes initiated by Henry. Under his influence, Parliament revoked the Catholic-leaning Six Articles and dismantled the restrictions Henry had placed, late in his reign, on the printing of the Scriptures. After a military victory over the Scots at Pinkie (1547), Edward distributed Bibles in the Scottish Lowlands in an attempt to convert the populace. He also confiscated chantries (endowments for saying of masses for the dead), endowed chapels, hospitals, and guilds. Demolition of these Catholic institutions garnered wealth for the crown. Somerset’s reforms also garnered criticism from both Roman Catholics and radical Protestants, who denounced him as overly-conservative. He got into further trouble by using his power for personal financial gain. When he was removed from being Lord Protector, it came as no surprise. In 1549 he made the mistake of placing John Dudley, Earl of Warwick, in charge of military forces that were to extinguish a revolt in Norfolk. Instead, Dudley, a radical Protestant, orchestrated the downfall of Somerset and himself became Lord Protector. Somerset was committed to the Tower and two years later beheaded for alleged treason. During his brief stint as Edward VI’s protector, Dudley promoted religious reform in England at a pace more rapid than Henry’s subjects imagined possible. He guided the Church of England from its still ambiguous religious status to one of Protestant distinctiveness. Dudley, usually called Northumberland (he made himself Duke of Northumberland in 1551), filled ecclesiastical positions with devout Protestants, the most influential of which was John Hooper, who became bishop of both Gloucester and Worcester in 1552. To Roman Catholics, Hooper was a radical in the cast of “fanatical” reformers Calvin and Zwingli. With Northumberland’s blessing, Cranmer revised his 1549 Book of Common Prayer, which, according to many Protestants, lacked the requisite flavor of reform. The 1552 Book of Common Prayer went further in abolishing medieval vestments and rejecting both Catholic and even Lutheran views of the Eucharist. Going further still, Northumberland attained royal assent to the Forty—Two Articles, which set forth a Calvinist doctrinal stance—including predestination—for the Church of England. Eventually, Northumberland fell into disfavor with reformers, both for his attempts to profit financially from his position and to secure ties to the crown through the marriage of his son to Lady Jane Grey—heir apparent as far as many Protestants were concerned. When Edward died in July 1553, however, Catholic Mary became queen. She sent Northumberland to the Tower, where he was executed within a month. Don Alban, Jr., is editor of Power for Living, published by Scripture Press.